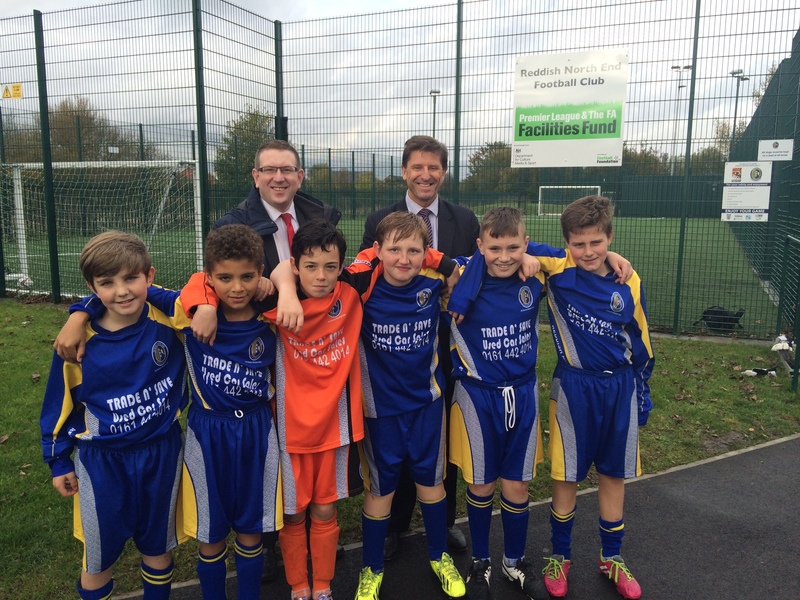 On Friday, Andrew Gwynne MP visited Reddish North End FC’s new facilities following a lengthy building project funded by the Premier League and the Football Association. The team is now housed in a refurbished clubhouse provided on a lease by Stockport Council in 2011 next door to their new third generation artificial grass pitch. The new pitch will be a Coach Education hub for the Manchester FA, where they can deliver a workforce education programme, and it will act as a venue for five and seven-a-side football. The aim is to have more than five hundred participants from the local community accessing the site on a regular basis. The Football Foundation worked with the Club and the Manchester Football Association to put together a comprehensive Football Development Plan which resulted in the Club being awarded a £418,513 grant from the Premier League and Football Foundation, which facilitates the distribution of funding from the Football Association. Additional funding was also provided for the pitch by Stockport Council and NHS Stockport. Since 2000 the Football Foundation has worked with the Manchester FA on 95 grassroots projects, meaning that the Manchester region has benefitted from £13.3m worth of its Funding Partners’ investment. “This stunning facility has rejuvenated the Club and given a fresh bit of stardust to Reddish. Many football facilities across the country are looking tired and have sometimes reflected quite poorly on the state of English football. I am delighted that the Premier League and the FA have been distributing some much-needed funds to local clubs in Greater Manchester.